Top: Zara (on sale for $22!) // Jeans: J. 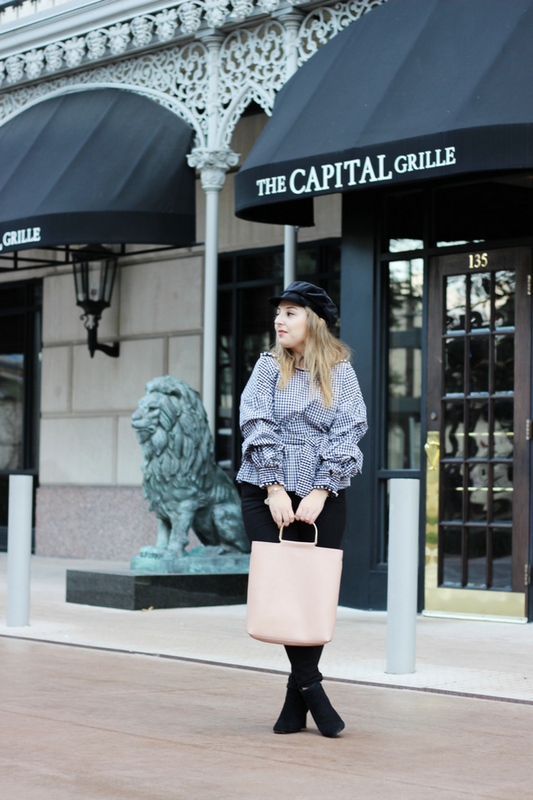 Crew // Hat: Zara // Bag: Madison West // Boots: Ann Taylor // Lips: Chanel Coco Rouge in "Mademoiselle"
First post of 2018! I decided to take the first week off of the year since I was dealing with some health issues and wanted to focus on resting and it was one of the best decisions I ever made. I'm a workaholic who usually doesn't believe in resting and in the past I've gone through a lot of problems because of the stress and burn out and this year I told myself that I've had enough and want to take care of myself both mentally and physically. I highly recommend everyone to start taking some time for themselves! Trust me, you'll come back feeling better than ever. Onto the outfit, I can't believe I get to walk around without a coat in January! Meanwhile there's a snow storm going on in Rochester, NY haha. If you're hesitating moving to a warmer city, just do it! I promise it's worth it. I'm head over heels in love with this top that I got from the Zara sale. It's a bit out of my comfort zone since I usually don't wear a lot of patterns and this one's a bit busy with all the details but I couldn't help it! 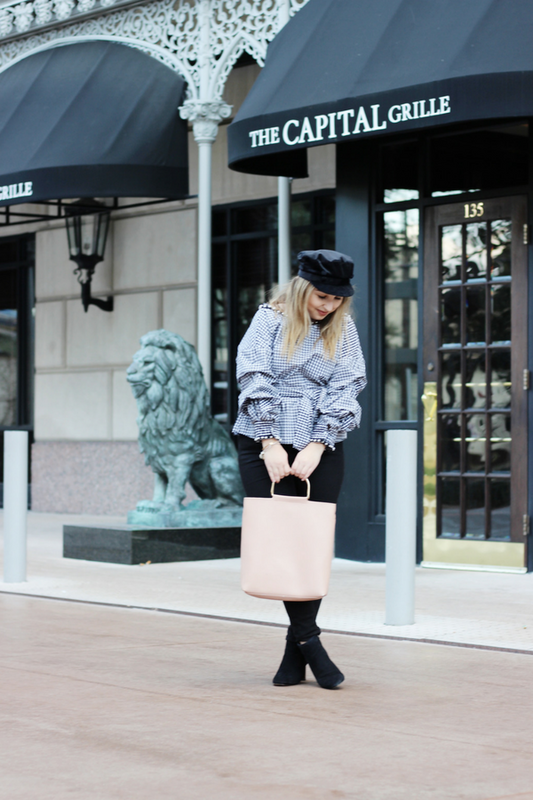 The pearl details, the criss-cross back, and the sleeves makes it one of the most unique pieces in my wardrobe and it's only $22 and still available in all sizes online. 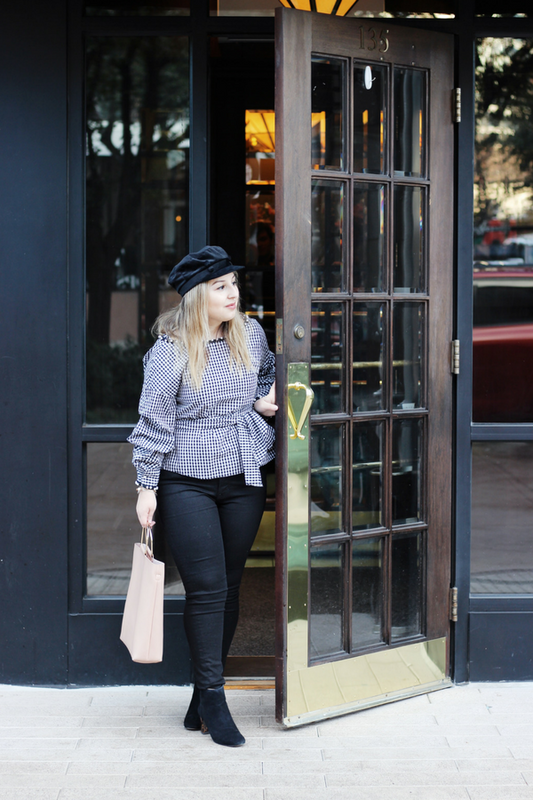 The style is also ridiculously flattering and gives the illusion of curves and hides all your trouble spots (perfect since I went to Shake Shack before shooting these photos! haha). Also can we take a second to talk about the shoot location? If you've been following me on Instagram, you might've noticed that I went to Hotel Crescent for the first time and it's SO GORGEOUS and feels like I'm back in France. When it comes to exploring Dallas, I decided to just slowly start exploring since I live here now and can see these things all the time (still feels weird saying that!). This is actually one of my goals for 2018, to stop and take the time to enjoy everything around me along with networking more and making more blogger friends since there's such a huge blogging community here. What are your goals for 2018? I'd love to hear them! Oh my gosh, I am in love. I would definitely be stepping out of my comfort zone if I got this top, but that's not stopping me from wanting to buy it hahah. Haha, thank you! Sometimes it's nice to take some risks with fashion! 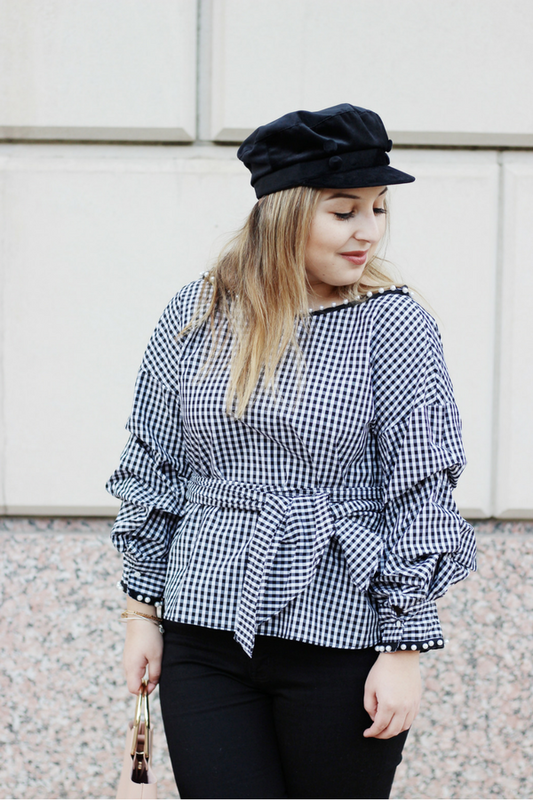 I love everything gingham and the ruffles and sweet back on this top just make it hard to resist! I'm on a no-spend month, but if I wasn't I would totally pick this up! I LOVE Zara!!! We don't have any stores here in Vermont but just over the border in Montreal they have a bunch of Zara locations so I always shop there when I head north now! This top is super flattering on you! I love the pearl detail! i'm super envious of people like you who can wear anything and look great in it xD that top totally looks darling on you!!! 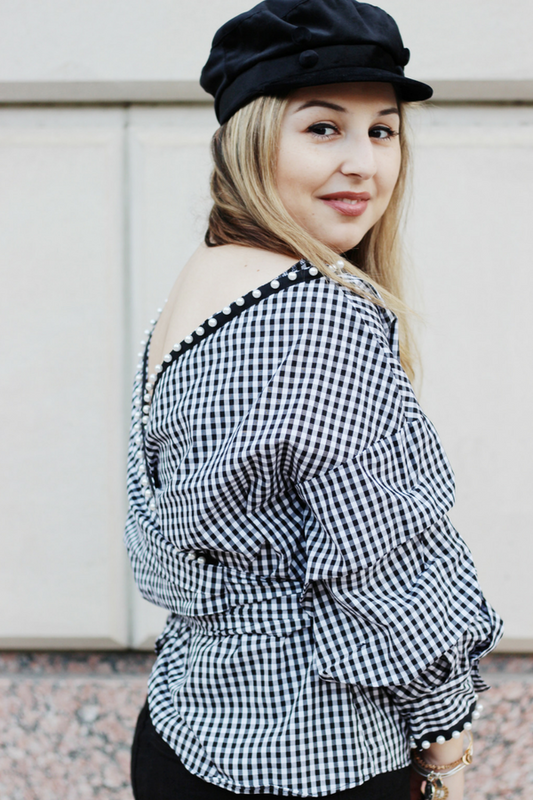 This gingham top is adorable, and so you are! I want this whole look! SO CUTE! I love the back of that top! That top is just so cute! Your style is AMAZING! Zara has the best finds-- this top looks great on you, love how unique it is! This top is so fun! I love the back and the pearl details!